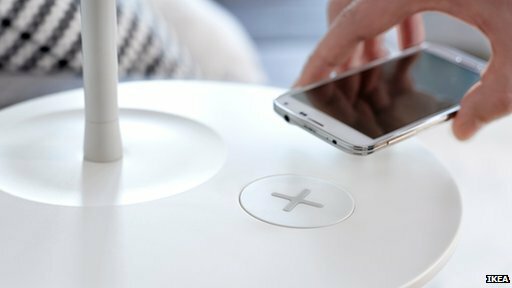 Furniture giant Ikea has unveiled a range of furniture fitted with wireless charging spots for mobile devices. 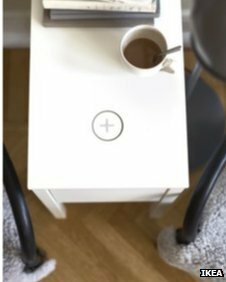 The Home Smart range will initially include lamps, bedside tables and a coffee table as well as individual charging pads for any surface. Ikea has used the wireless charging standard QI, which is also supported by Samsung in its latest handset, the S6. Environmental group Friends of the Earth urged caution over the recyclability of such products. The Swedish furniture firm will sell charging covers for incompatible iPhone and Samsung models. There are currently more than 80 QI-compatible handsets and 15 QI-enabled cars on the market according to QI’s backers the Wireless Power Consortium, an industry body whose members includes Belkin, Motorola, Panasonic and Sony. However it is not the only charging standard in development. The S6 will also be compatible with PMA, a rival wireless charger solution provided by the Power Matters Alliance, whose members include Starbucks, Duracell Powermat, Huawei and Lenovo. At the Consumer Electronics Show in January a firm called Energous demonstrated WattUp, a non-inductive system which it claims can charge gadgets that lie in a 9m (30ft) radius around the charger. Environmentalists said they hoped recycling was a priority for designers incorporating wireless charging equipment into their work. “A key principle that manufacturers of furniture with built-in wireless charging technology should consider is that the furniture is designed to be easy to disassemble for upgrade, reuse, repair or recycling,” Julian Kirby, resource use campaigner at Friends of the Earth, told the BBC. 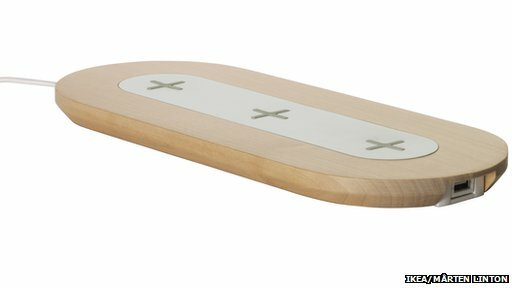 Ikea said in a statement that its wireless charging products are “easy to fraction at end of life”. “By adding wireless charging to home and office furniture, we minimise the amount of separate chargers needed,” it added. Additionally some existing users have reported on forums that their devices get hot while charging wirelessly. “The wireless charging standards are evolving,” said Ian Fogg from analysts IHS. “The industry has no incentive to allow devices to go hot because it means the charging isn’t as efficient as it might be. The Ikea range will go on sale in the UK and North America in April 2015, the firm said.